'Bridge Of Dreams' (Shuichi Hirao by Society for Japanese Irises, R. 1991) Sdlg. SH-3. JI (3 F.), 32" (81 cm), Midseason bloom. Standards purple (RHS 82A) veined darker, narrowly edged white; style arms cream to white, sanded and veined blue violet (93B); Falls white, blue halo, heavy sanding, veining and center streak of blue violet, yellow signal. Parentage unknown. Society for Japanese Irises 1992. From AIS Bulletin #289 April 1993 Introducing BRIDGE OF DREAMS (Hirao '92). Sdlg. SH-3, M, 32", 3 falls. Absolutely stunning Japanese iris with superb color contrast. Standards purple with darker veins and small white rims! Falls white with a blue halo and heavy blue-violet sanding and veining. There is a dashing center streak of blue violet also. 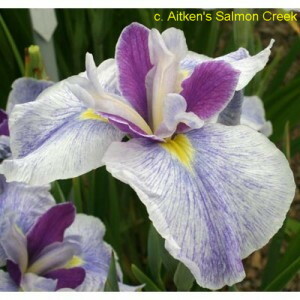 Talk about "dreamy" irises! Wow! $30.00. The Iris Pond.